It’s not all illicit antiquities and art crime around here: sometimes it’s traffic cones! Thanks to Doug Rocks-Macqueen for posting all of the talks in the European Association of Archaeology Meeting session “It Belongs on the Internet”. I thought the session was wonderful and very useful case studies and thoughts on the incorporation of the digital into archaeology things. I talked about a traffic cone. The cone that is placed on the head of the statue of Wellington here in Glasgow and our quest to save it. This one is a classic example of “I thought this was silly, but it is actually meaningful”. Have a look! 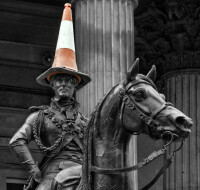 For 30 years Glaswegians have, through pouring rain and drunken hazes, bravely scaled a Duke of Wellington statue to place a traffic cone on his head. The cone-ing of the statue has come to symbolise many of the qualities that residents see in themselves: cheeky fun, delight in the absurd, and not taking anything unnecessarily seriously. Wellington-plus-cone is emblazoned on mugs and T-shirts and is a stop on bus tours. The cone has become a salient part of Glasgow’s identity. In 2013 when the City Council announced plans to spend thousands of pounds to prevent the cone-ing, we were shocked. We discuss how an online petition by the authors (who probably had better things to do) turned what would’ve once been an unseen planning decision into an international media storm. Within 24 hours we had 10,000+ signatures and the council relented. In this example of the success of direct action for preservation of heritage we believe the digital medium is what is important, especially because the heritage in question was threatened by the body tasked with protecting it. Online, signers were able to leave long comments articulating exactly what made the cone important. Rather than leaving heritage to be defined by those in power, the internet is a means for alternative, wildly popular conceptions of identity to be factored into planning decisions. We believe that despite the puns and silly photos the Glasgow Cone was a challenge to opaque decision making and a call for a more democratic heritage preservation process.